More Monkeys Slot Machine - Play Online at Slotorama! What’s better than have the luck of a monkey on your side? Having the luck of More Monkeys of course, and you get plenty of theme in this 1024-ways to win, Asian themed slot from Lightning Box Games! In this game you’ll be set high in the snowy mountain tops where a temple of majestic quality stands. The reels are set within this temple, one of the most serene places on earth. On the reels you’ll be trying to make winning combinations from symbols like the Koi Fish, Tigers, Pandas, card symbols nine through ace, as well as special monkey wilds and a bonus symbol. Read on to find out how some of these special symbols can create big win possibilities for you! Baby Monkey Wilds – The Baby Monkey symbol is the wild and substitutes for all symbols except the scatter bonus to complete winning combinations when possible. These are added to reels 2, 3 and 4 during free games! Monkey King Wilds – The Monkey King is Wild and substitutes for all symbols in the game except the Bonus symbol to complete winning combinations when possible. This symbol can appear on reels 2 and 4 only. Free Spins – Landing 3, 4 or 5 Bonus symbols on the reels triggers 7, 10 or 20 free games respectively. When you trigger the bonus, you’ll get a choice for your free spins reward. You can choose either 8 additional free games, 8 more stacked wilds on reel 3 for your free spins, or more multipliers where your prizes during the round will be multiplied by up to 8x. They good things come in 8’s and the do in this round with 888 different options! 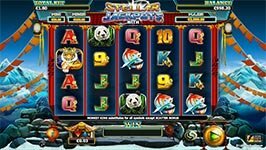 Stellar Jackpots – With stellar jackpots you’ll shoot icons to either reveal a prize and/or advance to the next level, or choose again. If the Jackpot level is reached, continue to shoot ships until you match 3 Mini, Minor or Major symbols. The bonus can end at any level once 3 x’s are revealed.